The Angels off-season was filled with ups and downs and as a fan masochist, I wanted to take a look at just how bad their third base situation is. After losing out on Adrian Beltre, the Halos are left with Maicer Izturis, Brandon Wood and Alberto Callaspo to man the hot corner. It may look bad on paper but it's even worse when you say it out loud and people give you the stink eye. 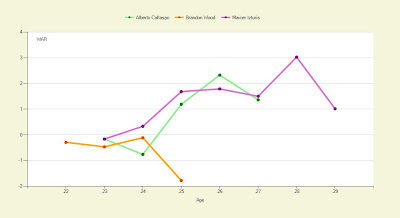 Here are the aforementioned players' WAR Graph by age (via Fangraphs). Click to enlarge. Ruh-roh. Izturis is the proud owner of a career high 3.0 WAR (in 2009) between the three of them and Wood has yet to crack a 0.0 WAR in the majors. Just roughly looking at the 2010 seasons of this trio of trepidation, it doesn't look like the Angels can plan on getting more than a combined 1.5 WAR from this rotation. I've been known to be delusional at times so allow me to put on my optimism hat for a minute before I have a panic attack. If the winds all blow the right way, they could at least be league average at third. All three have the potential to be a tick better than average at defense. 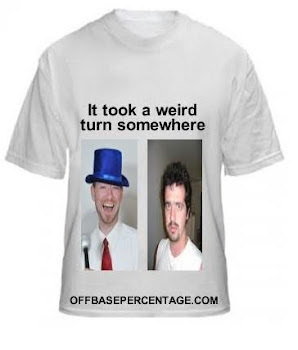 Izturis and Callaspo could get their OBPs back into the .330-.340 range. And if Wood was granted a wish during the off-season, he might be able to reach a .300 OBP. Wood was the future of the Angels power hitters but that ship has sailed and was probably sunk by pirates. But if the crew can combine for 18-20 home runs, the Angels' perfect storm would be Michael Young's 2010 season with better defense.